Since I began my own journey discovering my family’s past, I could never understand where a certain feeling of intense well being came from until I listened to an opening session at the Midwestern Roots Conference recently held here in Indianapolis. This feeling, which is hard to describe, stays with me all the time; it was and is a sense of very intense love and appreciation for not only my ancestors but also for my state and country. I’ve always loved history, and as the genealogist for The Society of Indiana Pioneers, I have the wonderful opportunity to steep myself in the rich stories and history of the state where I was born and grew up — Indiana. Little did I know how all my knowledge was affecting me and I think that you might be a bit surprised yourself when you read the rest of the post! Curt Witcher never fails to catch my attention, whether or not he is talking about the Allen County Public Library Genealogy section or the topic that he chose for the Midwestern Roots Conference. He is and will forever be associated, in my mind, with the ACPL because of the tremendous job that he (and a lot of others, I’m sure) has done to transform it into the United State’s largest public genealogy library. This year, Curt had the privilege of opening the conference and his title for this session was, “Your Story, Our History: The Power and Value of Story.” Well, let’s just say that there was never any question that this would be one session that I would for sure be attending and he didn’t let me down. He went on to explain in more detail about the article where research claimed that children were more resilient if they had a firm knowledge of their family’s history. Whoa… This validated me and instantly tugged at my heart; I knew this statement to be oh, so painfully true. To sum it up, they are more emotionally stable and can handle the up’s and down’s of life much better. Wow… just wow… I felt so immensely warm and fuzzy when he stated that there was actually research out there confirming what I had felt for so long and still feel very strongly about. But to hear that there was proof, a real study that had been completed, confirming that family history does indeed give you a foundation to live your life to its best, well, that was priceless. I could have left after that and been quite content knowing that my belief did indeed have proof to back it up. Oh, Curt really summed it up in those words, didn’t he? Now it is up to all of us to share this knowledge, our knowledge of our families and their stories, so that our children and grand-children will also know their stories and have a foundation to build their own lives upon. The article, “The Stories That Bind Us”, written by Bruce Feiler, March 15, 2013 for The New York Times, gives a more in-depth explanation of the study and the epiphany that Bruce, the author, had within his own family. It is inspiring and if it doesn’t convince you to start writing down your own memories, I’m not sure that anyone or anything could. So, what to do with this information? I think that we simply need to use it as a kick-starter to push this to the fore-front of our to-do lists. 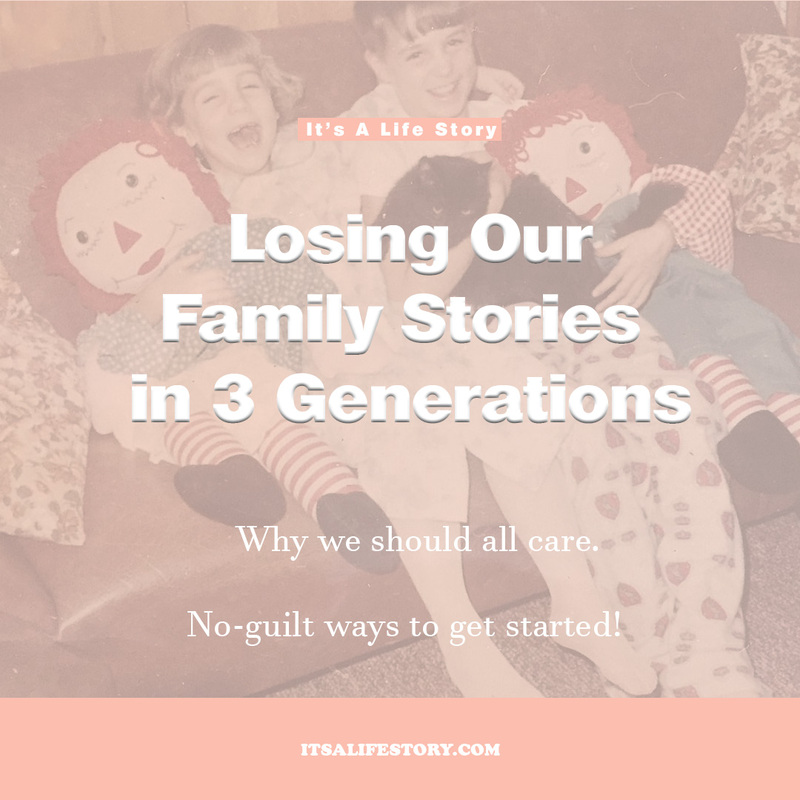 After all, what would you give to have stories that your great-grandparents had written themselves, all pulled together into one place, for you to read and enjoy and pass on to your own family. Begin with yourself. Start a notebook of your own stories – in no certain order. Just simply let the stories come as they may. Look at photo albums and think about what is going on in the background of a photo – the story behind it. Think about places, people, emotions. It’s ok to start with the basics and then branch out. Don’t be afraid to talk about current events as well. Even tough times that you have gone through, is certainly worth getting down in a written form. You can even post photos into an app like Day One where you can talk about the picture and it will save by date. There is no time like the present. Start to add your parents’ and grandparents’ information, or if they are still alive, think about getting them on video or audio explaining about their childhood, marriage, work, and family. Photos are great conversation starters. None of these things need to take more than just a few moments, but it is important to keep adding more and more so that one day, you will find yourself with a rich history that can be shared for generations. Get the old photos out and start to write down whatever information that you might remember. These are great starters for your parents and grand-parents. And last, but not least, we need to start to share all this information in ways that our kids and grandchildren will be able to remember and take with them. So, I know this all really sounds like a huge commitment and that’s where I plan to come in and try to take some of the overwhelming-ness (can I use that as a word?) out of the project. As you follow along, my plan is to offer memory prompts to get you started with your own stories and ideas on how to get bashful parents and grandparents to start to open up and share their wealth of stories. It is all a process, but it doesn’t have to be painful! (That’s where I plan on helping.) If you know someone that has children or grandchildren, please share this post. We tend to focus on making millions of memories with our children and grandchildren, but it’s equally as important that they know the generations that made them who they are and will become. Too many times we feel like we can’t do anything to make “things” better and here is one fairly easy way to leave your mark – by leaving your story. For anyone on Instagram, follow me on @_ItsaLifeStory where I show you how I am documenting my own family momentos for my children to see. How will they know what anything is if I don’t tell them! It’s just one way that I’m working through this myself in order to pass on my own memories. For those of you on Facebook, I have a page for my website as well. You just need to search for “It’s a Life Story” or @itsalifestory. When you find it, click on the LIKE button so that you receive my updates. I have a lot going on between the FB page, Instagram, this newsletter and my website but I think that each one has their place! Here’s a tip: I use the Day One app in the evening when I take a few moments to do some decompressing from the day! I can use a pic from the day or take a quick one of a photo or momento to use as my own memory booster. For anyone that also does scrapbooking, this is an excellent way to write your journaling to be used with a group of photos in a layout when you are ready to work on them! Remember to SHARE this with anyone and everyone that has children and grandchildren! Let’s show them exactly how much we love them by giving them that all-important piece of ourselves! Suggest that they sign up for my email list to receive newsletters in the future so they can find the inspiration and ideas of how to get started as well as how to pull all their research and hard work together into one format that can be shared across generations. Together, we can make sure that we will not be forgotten in three generations!